LA ROMANA, Dominican Republic (Jan. 17, 2019) – For all the headache it took Alvaro Ortiz just to get on property for this week’s fifth Latin America Amateur Championship, he hardly seemed frazzled by the time his first tee shot was in the air on a still day at Casa de Campo’s Teeth of the Dog course. An opening 6-under 66 on this Atlantic gem, which is deceptively penal for being so beautiful, was admittedly flawless – or nearly so. Still, it gave Ortiz the early lead. Maybe it’s karma, and if so, it’s well-deserved on many levels. Ortiz, a 23-year-old from Mexico, had two flights cancelled early week – first from Guadalajara and then from Panama. It pushed his arrival a day, but Ortiz took a big positive from that – especially considering he’s the man everyone wants to talk to. Ortiz is a universal favorite this week, and that much was clear as he walked off the ninth green (his last) under a light rainfall. He is greeted as a champion even if he technically is not. For one thing, he’s familiar. Ortiz is one of 19 players in the 108-man field who has teed it up in every LAAC since the tournament was born in 2015. He brings the best record to Casa de Campo, having finished T-3, DQ, T-2 and second. His No. 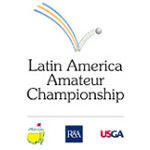 96 position in the World Amateur Golf Ranking is the fifth best in the field. It was a good morning for Mexico, considering that just a few hours before Ortiz turned in his round, the country’s Mayakoba Resort had been announced as the host for the 2020 LAAC. It’s good news for his compatriots, if not for Ortiz. Last year’s champion, Chilean Joaquin Niemann, was vocal about having stayed amateur just to give the LAAC one more shot. He entered as the favorite and he won, which isn’t always the case at this event. Ortiz’s motivations for playing this week despite finishing school at Arkansas last spring were similar. First there was the Palmer Cup, a summer team event for college players that included an international component for the first time this year. Even though that was six months ago, the Masters invitation for this week’s winner provides a little incentive. In the meantime, Ortiz has spent time grooving swing changes that would specifically help him play more accurately off the tee. Judging by Wednesday’s round, they’ve taken hold. Teeth of the Dog, as Ortiz knows from 2016 (despite the unfortunate DQ), is a course that demands precision. Hit it in the fairway and you can score. That becomes more difficult, of course, when the wind comes up.